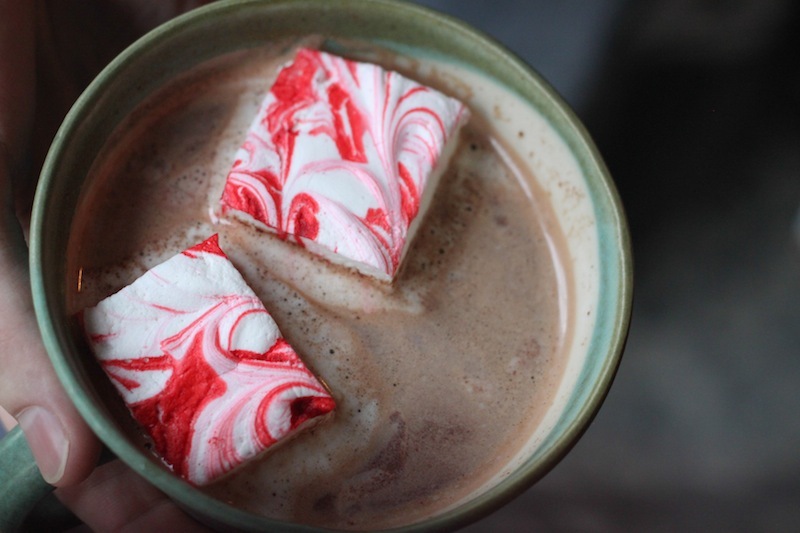 It’s Time for a Reboot: Peppermint Marshmallows – Eat Me. Drink Me. December is a wasted month. Or maybe it’s better put this way: for the entire month of December, I’m useless. It’s like my brain has decided eleven months is enough months of functioning, and that the twelfth month is a month of rest. While the pace of work picks up, my brain revolts. No, I will not perform for you this month, it says. It’s a month of goofs. I forget major and obvious steps in the tasks I undertake (oh, there’s a whole middle of the film to subtitle?). I have trouble focusing (must wrap gifts, write recipes, send emails, clean bathroom walls, and paint toenails AT THE SAME TIME). And worst of all, I make mistakes so sloppy it pains my meticulous January-November brain (misspelling the name of a rather important email recipient? Twice? Check). I arrived in my ancestral country about a week ago and have done – nothing. I sit on the couch and brush up on my cell phone game skills. I read my book. I let my coffee be made for me and ushered to my slothful seat. My brain has entirely given up. And I’ve let it. It’s a wonderful feeling. I’m a firm believer in viewing your body’s refusal to capitulate as a self-defense mechanism. Deny yourself any breaks from your to-do list, and don’t be surprised if your leg seizes up or a winter cold levels you full-force. 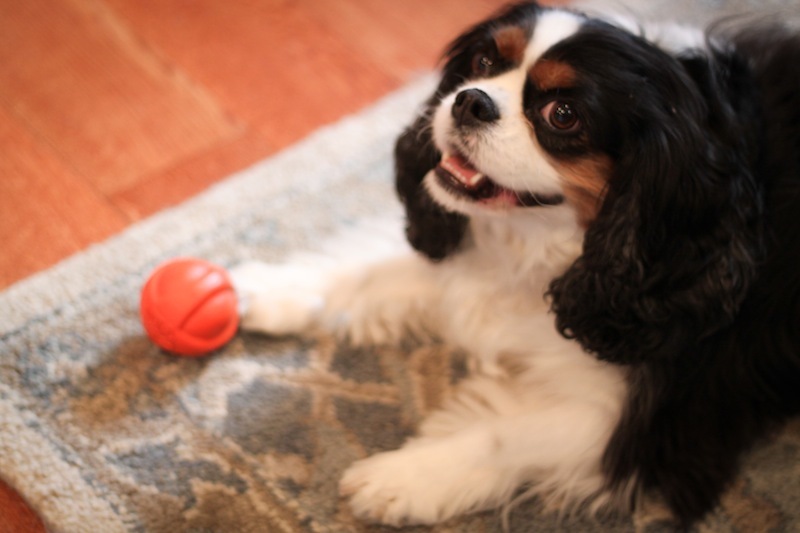 Work your brain too mercilessly, and it might just give out. Clearly, my brain needs a break. I let it wander. If baking cookies is too much work, I tell it, That’s fine. Go lie down. If it wants to take a walk around Baltimore’s cool, blue Inner Harbor, I follow it outside. I’d never made marshmallows before, so the whole process was an experimental mess. I’d stir hot sugar boiling on the stove, then jump over to the next burner to whisk gelatin into simmering water, then over to the counter to whisk egg whites, then back to tend the sugar popping dangerously. I don’t think it was really as difficult as my December brain made it out to be. But I had to read each step about twenty times before being able to put it into action. And marshmallows require fast reflexes. Thankfully, I had family to help – to hold to the bowl and pour in the egg whites and make sure the sugar didn’t coat the kitchen in a candy glaze. Together, we admired the sticky mass settling into itself, exclaiming with surprise when it started looking like a marshmallow. Exclaiming with even more surprise when it started tasting like one. 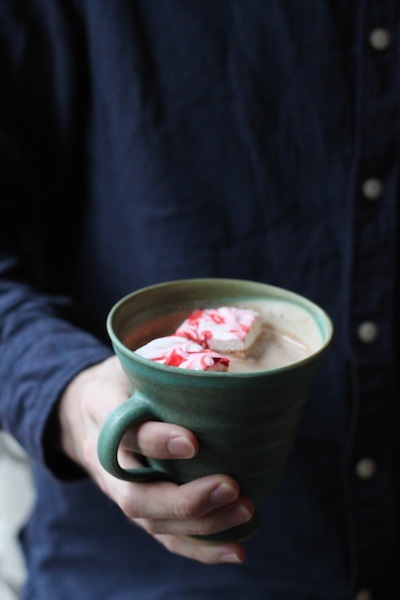 Rich hot chocolate bobbing with pepperminty clouds of fluff was quite a reward for all the work – which apparently was just enough to make my brain totally give up the ghost. Slowly, as the days have drifted past, I can feel my brain beginning to wake up again. December is drawing to a close, and I see sparking synapses on the horizon. Oh January, you cannot come too soon. If the length of my recovery time is any indication of the state my mind was in, I think a fitting New Year’s Resolution might be to take more care of my brain between January and November, so it doesn’t leave me for a month-long vacation at the end of the year. Then again, maybe in a time of overstimulation, activity, and events, it’s good to let your brain go, to go back to being a child – if only for a little while. I highly recommend making these marshmallows with a cooking buddy. There are a few steps you need to do nearly simultaneously – such as preparing the gelatin and egg whites while making sure your pot of bubbling sugar water doesn’t caramelize or explode. Yikes! If you’re going solo, have everything for your three separate stations (sugar, gelatin, egg whites) set up in advance, so each step can be done quickly. Adapted from Martha Stewart. Coat an 8×8-inch pan with cooking spray, then line it with parchment paper. Coat the parchment paper with cooking spray as well. Set pan aside. While sugar is boiling, stir gelatin into ¾ cups water in a small saucepan. Let stand for 5 minutes to soften. Whisk over low heat for about 3 minutes until the gelatin is dissolved. 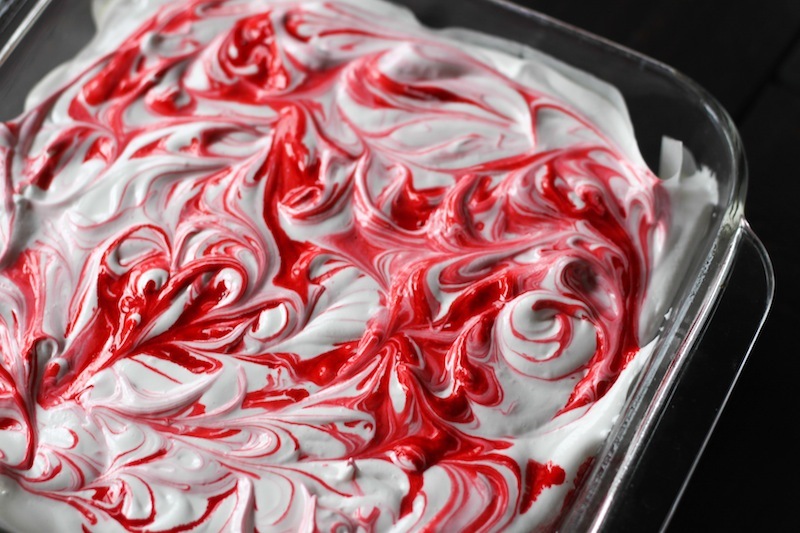 Remove from heat, stir in peppermint extract, and set aside. 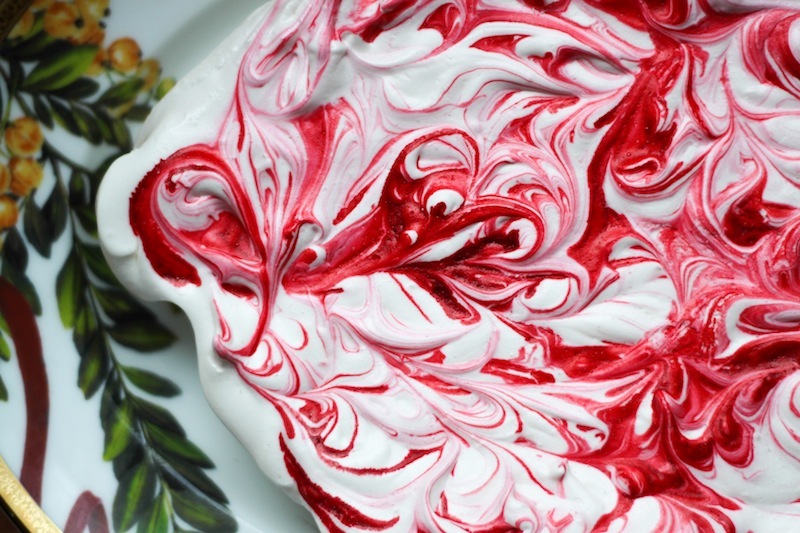 In a large bowl, beat egg whites with a handheld electric mixer until stiff (but not dry) peaks form. By now, your sugar should have finished boiling (remove from heat as soon as it reaches the correct temperature). Using the handheld electric mixer, whisk gelatin mixture into sugar mixture. Return to your large bowl of beaten egg whites. 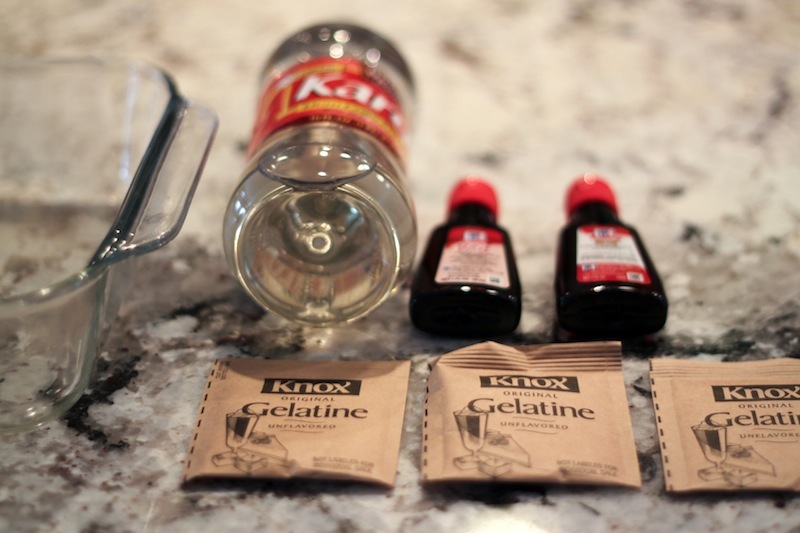 With the mixer running, gradually add gelatin-sugar mixture. Beat on high speed until very thick, about 12-15 minutes. Pour mixture into the lined pan. 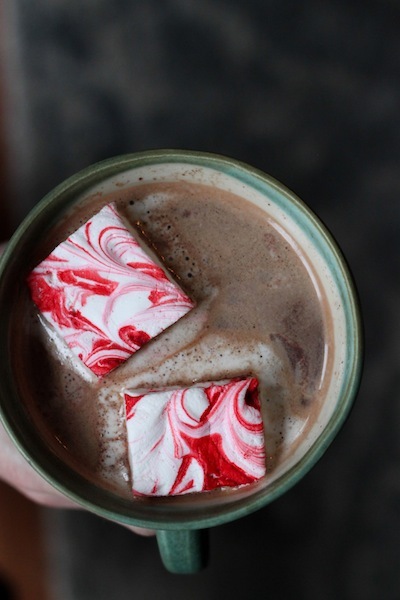 Drop dots of red food coloring across the surface of the marshmallow. 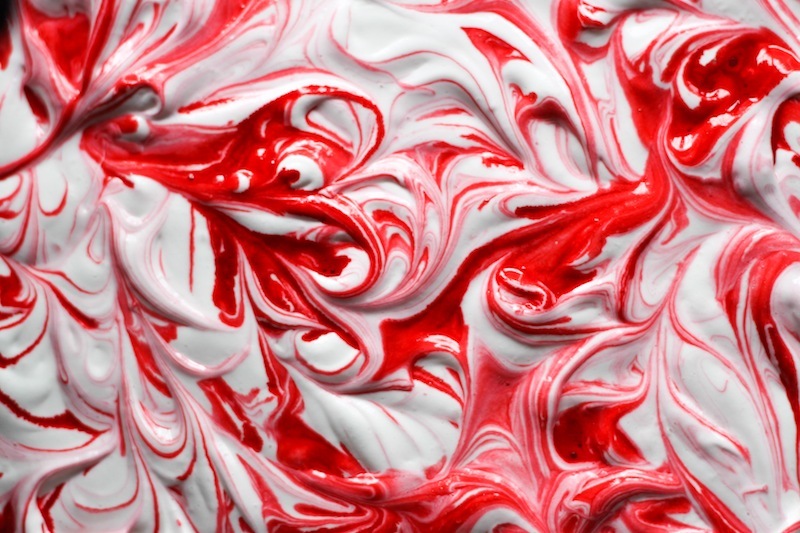 Using a toothpick, swirl the food coloring into the marshmallow to create a marbleized effect. Let the marshmallow stand uncovered at room temperature until firm, at least 3 hours or overnight. Cut into squares. I ate one of the peppermint marshmallows. It was delicious and beautiful to look at before eating.